This angular house combines two things we really love – floating architecture and self-sufficient design. FreiLichtHaus can produce its own water, electricity and heat and is currently being developed by scientists for the largest artificial lake district in Europe located in Germany. The project coordinators claim these state-of-the-art green homes can boost the regional economy and transform the lake district, which is currently poorly served by utilities. The two-level house stands on a 139-square-feet pontoon and offers 1,334 square feet of living space, including a terrace which overlooks the lake. 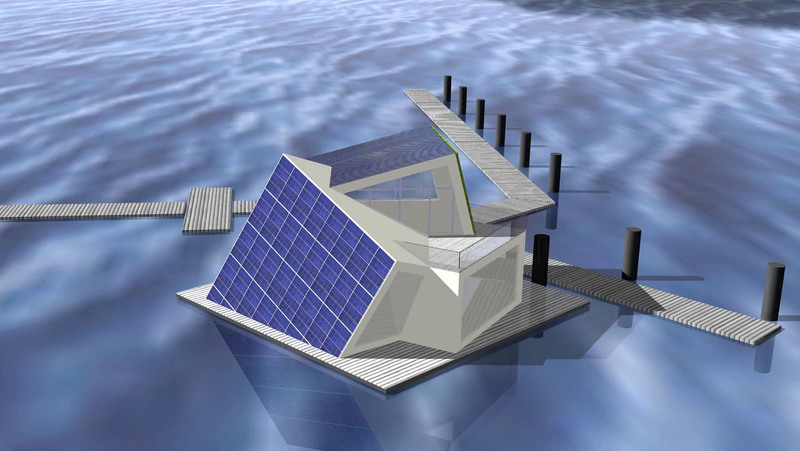 Solar cells cover the envelope, with battery systems integrated into the textile concrete walls and stairs. During wintertime, a salt hydrate fireplace provides necessary heat. This works by liquefying the salt hydrates placed in a tub above the fireplace, which then absorb heat from the fireplace. The great thing about this technology is that the thermal energy contained within liquefied salt hydrates can be stored almost indefinitely. When the heat is required, crystallization is triggered by radio-based technology – like commercial pocket warmers. Because the heat generated by the fireplace isn’t enough to warm the house throughout winter, the scientists included a zeolith thermal storage unit in the pontoon; moist air that allows the unit to give off heat activates the zeolith minerals, which are then dried out during the summer. An adiabatic cooling system that doesn’t require electricity but is instead based on evaporative humidification principles addresses the cooling requirements of the building. The water supply is based on a combination of ceramic membranes and different electrochemical and photocatalytic processes. 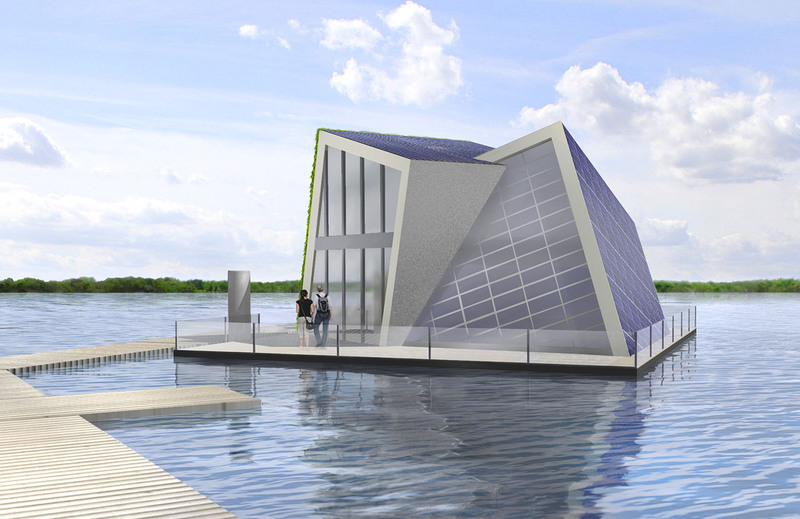 The project capitalizes on the fact that floating homes are becoming increasingly popular in Germany. 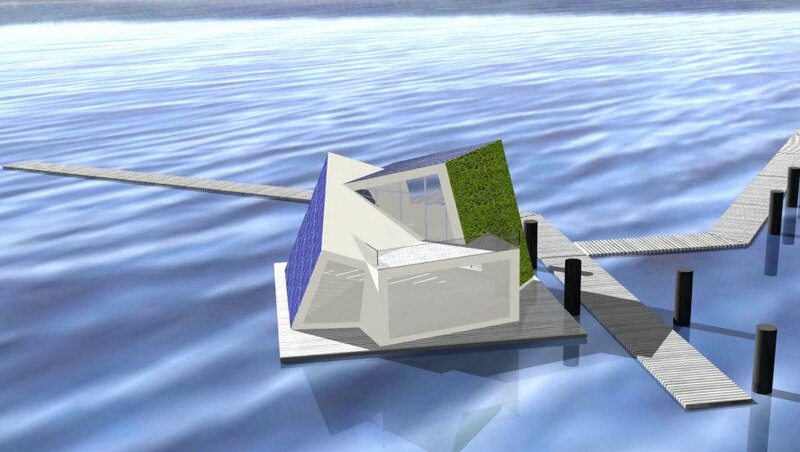 Scientists from two Fraunhofer institutes and two German universities are working on delivering the first floating houses to the Lusatian Lake District, located between the states of Saxony and Brandenburg. The first FreiLichtHaus is intended for Lake Geierswalde, northwest of the city of Hoyerswerda and will be completed by 2017. We can’t wait to see it built. 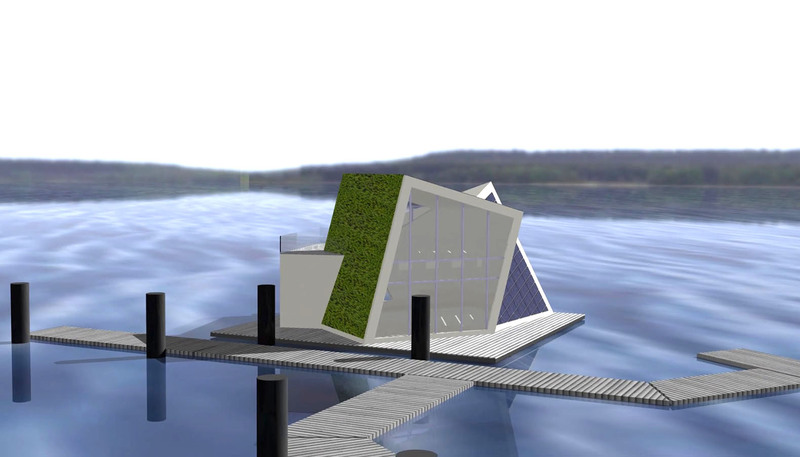 FreiLichtHaus floating home concept for Germany.